any high offset 4 bolt wheels? so trying to improve upon the tremendous body of work before me, I wanted to attempt the rear wheel skirts. Only I was hoping to make things a little more flush/less bulgy by finding some skinny wheels and/or high offset wheels. Of course I'm not about spending $100/wheel + tires. I don't see any real problem redrilling the rotors/drums to another 4 bolt pattern so what cars came with high offset wheels? so trying to improve upon the tremendous body of work before me, I wanted to attempt the rear wheel skirts. Only I was hoping to make things a little more flush/less bulgy by finding some and/or high offset wheels. Of course I'm not about spending $100/wheel + tires. I don't see any real problem redrilling the rotors/drums to another 4 bolt pattern [B]so what cars came with high offset wheels? I don't come in here much anymore as i'me spending more time in developing engine fuel management modifications to reduce consumption., but anyway , I saw this post and had to respond to it. Just don't ever use wheels that deviate away from the stock offset. On the front and rear moving the centreline of the wheel further outboard will significantly increase wheel bearing loads. On a car with stub axles there will be an increase of load on the axle , which could cause it to fail. Even a 1 inch increase in offset on the front will make the car very twichy in the steering , which is dangerous. You will also be wearing out ties rod ends , ball joints and the steering rack much faster than normally. This is why in most countries increasing the offset by more than an inch is illegal. If a mechanical failure like this causes an accident you will be held fully liable. Do yourself a favor , and just forget about this idea . it is way dum. FYI, more offset means moving them inboard, so maybe the rear wheel skirts don't have to buldge out. NO . 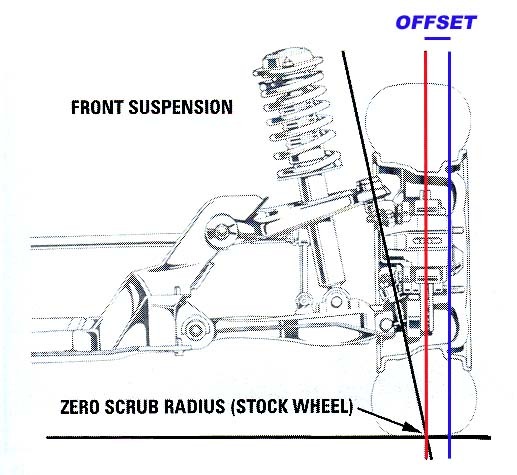 more offset (aka - positive offset) pushes the rim out further away from the suspension components , less offset does the opposite and moves the rim inward. Uh, no, your first link shows a picuture of Positive offset where the blue line is where the wheel touches the hub and the red line is the centerline of the wheels. Uh, no, your first link shows a picture of Positive offset where the blue line is where the wheel touches the hub and the red line is the centerline of the wheels. UMM ,,yeah ,,thats what it is ,,and exactly what I said. In that diagram - Increasing the space where it says OFFSET will push the rim outward , whether this is done by hub modifications, wheel spacers or different wheels the result is the same. The center of the wheel will become more and more outboard compared to the center of the bearing and its loads will increase. Sorry dude, but after being corrected on caster I made sure I had the direction on this one right. Positive offset moves the MOUNTING POINT outward, not the rim. The rim and the rest of the wheel move inward and are limited by the suspension components. There is a similiar stress on the bearings as well if you push your wheels in too far relative to the bearings I'm certain, but understand that I am not trying to move the wheels out, but rather in to clear the wheel skirts. It's nice to get an opportunity to return the favor Temponut From the picture of positive offset above, and all the links provided (i.e. tirerack) "Positive = The hub mounting surface is toward the front or wheel side of the wheel. Positive offset wheels are generally found on front wheel drive cars and newer rear drive cars." "Backspacing" is another term for the difference between the plane of the rim center and the plane of the mounting face of the hub, but the terms are opposite. More offset will move the center of the rim towards the center of the vehicle, as will less backspacing. For some highly offset hub wheels, look into Porsche wheels, but they will not be cheap, and likely none too narrow. I have a 69 Saab with 4 1/5 x 15 alloys having a 50 mm offset and a 5 x 170 bolt pattern. The wide bolt spacing would leave lots of room for re-drilling to what I suspect is a 4 x 100 on the Swift. No, mine are not for sale.